Prior to the establishment of PAM Sabah Chapter and the Architects Act 1967 (Act 117) & Rules in Sabah, I was fortunate as the first local practicing architect in Sabah, to be able to take an active part in their implementation. I graduated as Bachelor of Architecture from the University of New South Wales in 1966 and proceeded to do the postgraduate course of Master of Town and Country Planning in the University of Sydney. I returned to Sabah in 1968 and became a partner of George Chin & Partners, Architects & Engineers. As I did not take up a Colombo Plan Scholarship, I was not required to serve government service on my return to Sabah. I became the first Sabahan Architect to commence Private Practice. The few graduate architects that return had to serve a minimum of two years in the Architect Dept. of J.K.R. as most of them were under the Colombo Plan Scholarship. The architecture and engineering practices at that time were under the control of the Jabatan Kerja Raya (Public Works Dept.) which kept a registration of Persons Authorized To Submit Building Plans. Architects were authorized to submit also Engineering Drawings. There were two category of registration. Category A were persons who were authorized to submit architecture and engineering drawings for approval and Category B were persons who were authorized to submit limited scope of works in their architecture and engineering submissions. Category A included all qualified architecture firms which were mainly expatriate firms and some local practices that have no limitations in their submissions. I left George Chin & Partners and on March 1969, I commenced my own private practice under Lawrence Chin dan Gabonggan Akitekn berkanun. 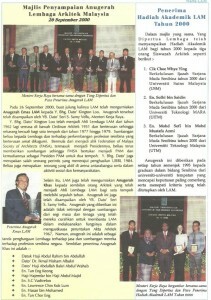 There were at that time only two Asian Architects that are members of PAM. When I joined PAM in 1968 (Membership M153), I was also an Associate-member of the Royal Australian Institute of Architects (in 1966) and the Royal Institute of British Architects (in 1967). The Chief Architect in J.K.R. Mr. David Cross was the Eastern Representative (Sabah & Sarawak) of PAM and when he left Sabah for U.K., I was appointed by PAM to take over his appointment. I was therefore the Eastern Representative (Sabah & Sarawak) of PAM and also the Committee Member of the Council of Architecture Education of Malaysia from 1970 to 1974. I was also the Board member of the Board of Architects Malaysia (Lembaga Akitek Malaysia) from 1973 to 1984. Prior to my appointment as the Eastern Representative (Sabah & Sarawak) of PAM, some of the architects both in private practice and in the government service decided to organize the Sabah Association of Architects. It was not so much as to regulate the practice of architecture but as a social organization to keep the profession informed; in Kuala Lumpur the was the move to regulate the practice of architecture in Malaysia with the establishment of the Architects Act 1967 (Act 117). In one of the PAM meetings in Kuala Lumpur, I being the Eastern Representative (Sabah & Sarawak) of PAM, brought out the question of the architects in Sabah was reluctant to become members of PAM as they would have to sit for an examination. In order to regulate the practice of architecture in the eastern states of Malaysia, I proposed that exception be considered for architects to sit for the entrance examination to become PAM members. With the approval from PAM Council that architects be granted membership to PAM without entrance examination within a twelve months period that year, I managed to enroll all the architects in Sabah to PAM membership. As for the Architects Act, I also managed to convince the Board that as it was the J.K.R. that regulated the registration of Persons Authorized To Submit Building Plans, all those who were permitted to submit Building Plans without restrictions be granted Registration as Architects in the Act and those that had restriction in their submissions be registered as Building Draughtsman with the same restriction as in their J.K.R. Registration. As for the status quo to submit architecture and engineering drawings for approval, it was agreed that there would be no duo registration; a person must decide to either register himself or herself an architect or an engineer. In the 60s, there were a few architecture/engineering practices in Sabah and those expatriate firms were charging 7½ % fees while those local firm’s fees were 3 to 4% being not academically qualified firms. There were few qualified engineers and architects could submit engineering drawings. In the 60s and early 70s, there were no mechanical and electrical engineers, so architects have to prepare and submit electrical drawings. There were no quantity surveyors, so architects have to do estimates and simple bills of quantities. Architects were then very much in charge of a project. 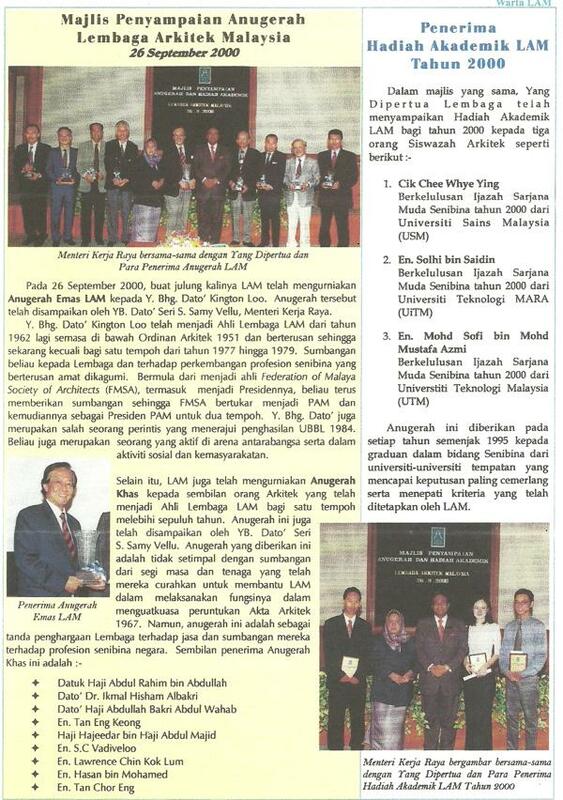 As a contributor in the organization of the practice of architecture practice in Sabah and Sarawak, I was one of the ten Architects acknowledged by Lembaga Arkitek Malaysia on 26 September 2000. Ref. attachment. Ar. Lawrence Chin Kok Lum. LAM A/C 5, PAM M153.